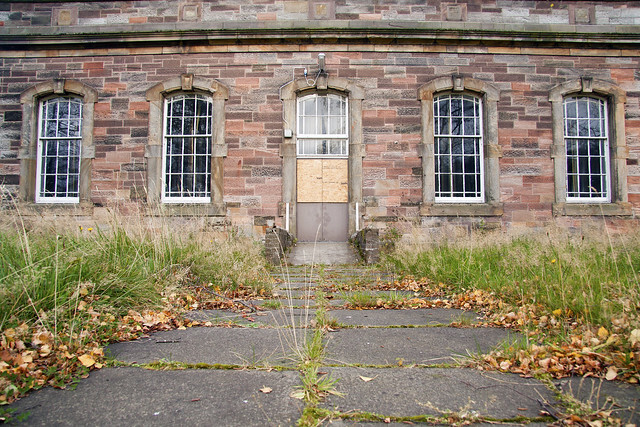 In October 2011 we paid a visit to Rosslynlee Hospital near Edinburgh, which closed completely in 2010. The main building was erected in 1874 with a number of new ‘wings’ and other buildings added over the years since. 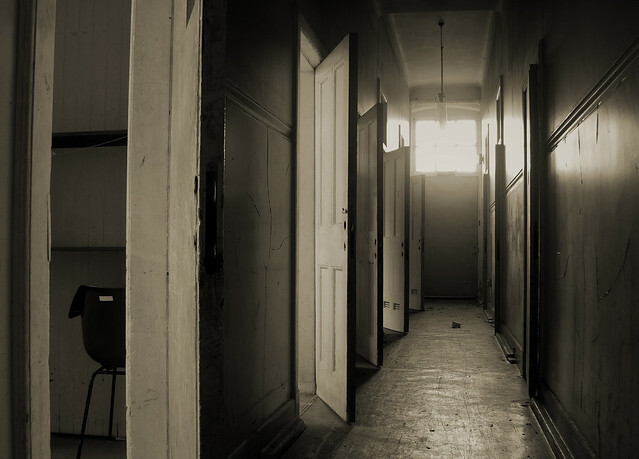 The hospital has since been subject to a number of explorers, metal theives and other such people with it beginning to show signs of their visits. 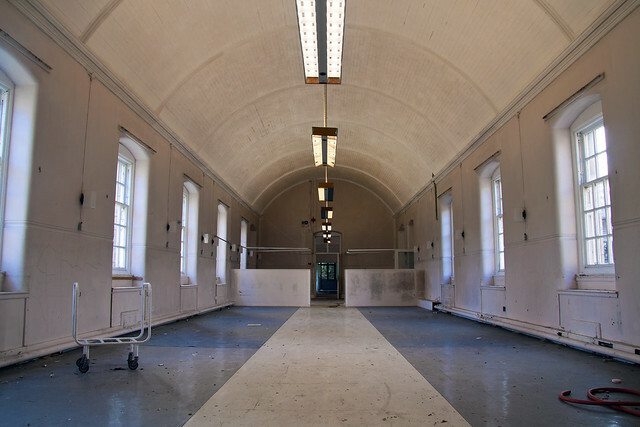 A few of the newer outbuildings are reachable through a number of glass corridors which reach out from the former main hospital building. 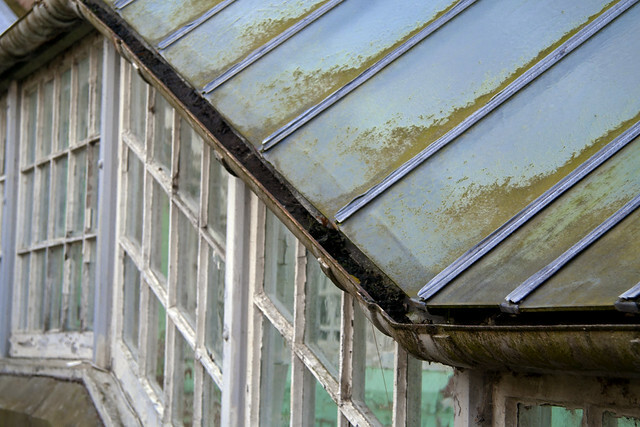 Once within the hospital you will see that a lot of items still remain from its operational days. 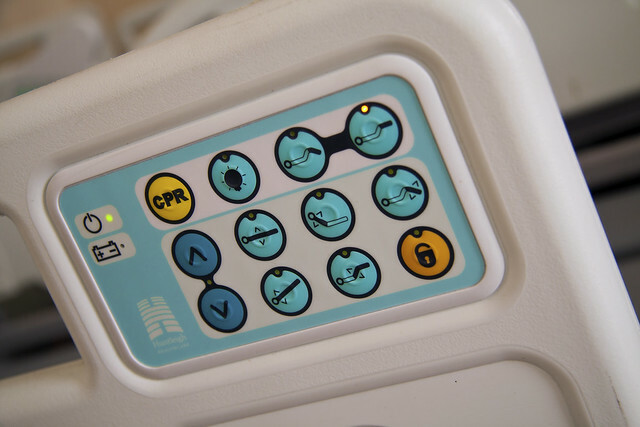 In one particular room there are a number of unused hospital beds lying in limbo, some of which still have power running to them. 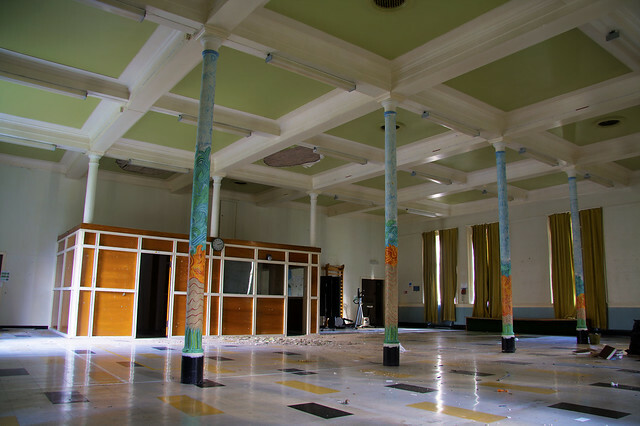 The former gym hall lies fairly empty with a couple of old exercise bikes lying in the corner, a fuse ball table, and table tennis gathering dust. The ceiling of the hall has finally given up and part it of it has collapsed. 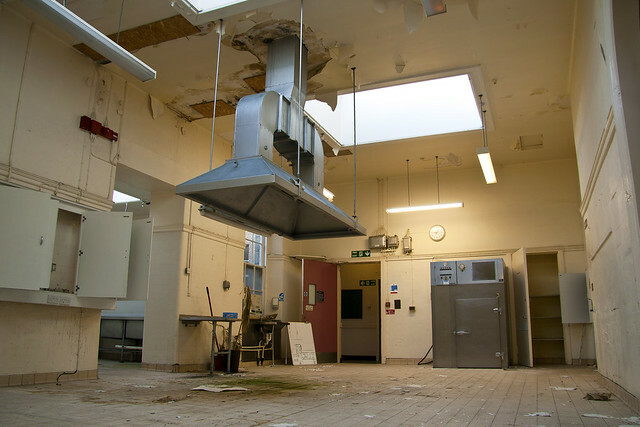 The kitchen of the hospital has been stripped out with the exception of the blast chiller which you can see at the back of the room here. 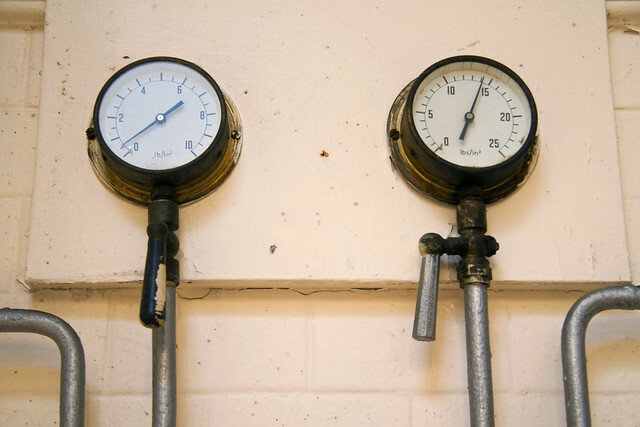 We originally thought these were pressure gauges of some sorts but were then reliably informed that they are in fact density gauges. In one part of the hospital is the geriatric unit complete with zimmer frames and a certain smell I will probably always associate with it. 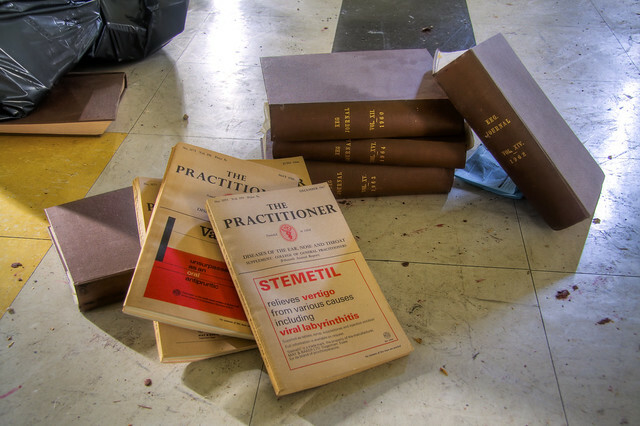 Any budding medical students might find these handy. 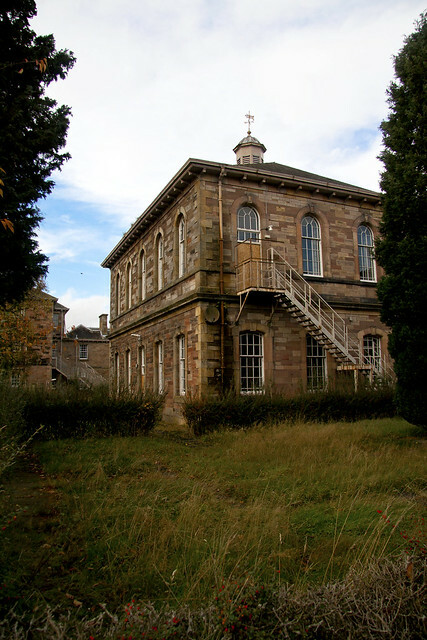 Within a newer outbuilding was a corridor of small offices with every door handle removed and the rooms emptied. 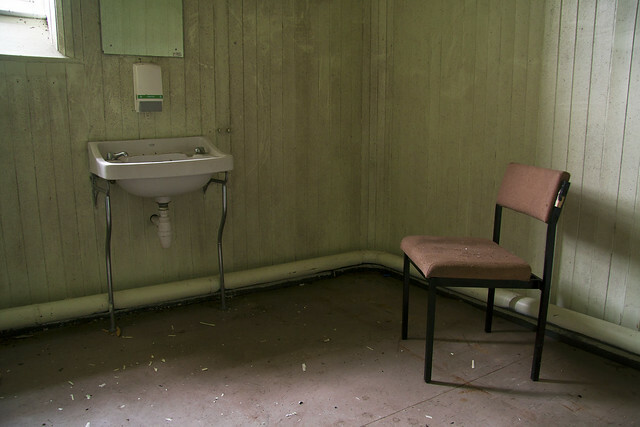 An urbex explore wouldn’t be complete without a lonely chair shot. 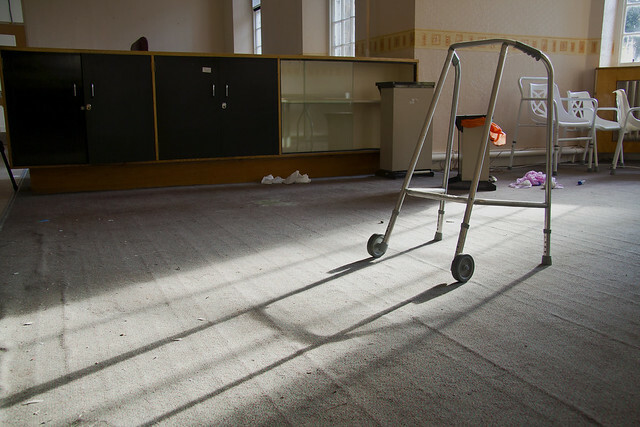 The remains of a linen trolley passing the time in a still powered ward. I spent my youth at Rosslynlee.I distinctly remember the cricket pitch,tennis court and the dances and concert parties held there which members of staff and families could attend.It was an idyllic place to grow up in. Hi Annabelle, what year(s) would you be referring too? My mom and Dad met there in 1951………and the rest is my past. I would like to make a short video/film, and this place would be awesome to use for it. Who would I contact about gaining access to this place? hi there, I am doing a project for haunted and abandoned sites and heard rosslynlee was a great place. my father does photography and got a couples of great photos. I heard the buildings meant to be dangerous but would really appreciate if I could get some access into the hospital before it shuts down to get a few project photos. many thanks and hope to hear soon. Me & my partner were here last night for a spooky Halloween.. We were around the hospital and took videos and pictures, we took one individual picture and when we went to view it for some reason it wasn’t there, we took a video and it corrupted but other photos and videos were fine, we found this weird as we were certain we seen orbs on the video and photo that was deleted, the lights were on at night when we viewed the hospital as security was inside, we were round one part of the hospital and heard a big band and scratching sounds so we left that area. It’s is known the building can’t be entered but the White long building which looks like different ward rooms – one window is open which my partner went into and was scary, chairs ect where left there and loads of doors to go in and out, heard a weird noise so we left there also. Overall was great for video and photos and good for a spooky night.